Include the New Wembley Stadium, Heathrow Airport’s Terminals 2 & 5 and Crossrail. We deliver high quality measurements that contribute to our customer’s understanding of the projects we work on, enabling them to make informed decisions. Most new construction in congested cities involves going down as well as up. There is often as much of the structure below ground as there is above. Concrete retaining walls contain the basement and must be monitored whilst the earth inside them is removed and the substructure is formed. Geotechnical Observations can measure displacements of the retaining walls manually using an inclinometer probe or automatically using SAAs. Where props are used to support the walls the loads in them can be measured using strain gauges. The overwhelming majority of the UK’s rail network was built during the 19th century using methods that pre-date our understanding of engineered fills and cuttings. Many of the clay embankments have suffered problems associated with poor ride quality caused by the presence of mature vegetation. Since Geotechnical Observations' formation we have been at the forefront of research into the monitoring of clay slopes. A recent paper (Géotechnique, 2015) presents details of one such study. In December 2000 a major landslide occurred to the north of the M25 just east of junction 6. The movement mobilised about 90,000 m3 of the slope and closed the hard shoulder. Geotechnical Observations has been monitoring the escarpment since November 2002. Since that time we have installed inclinometers and piezometers. We have also helped a number of the operators to understand the behaviour of the slope and implement a number of remedial solutions. Our work continues and we are still making monthly visits to the site. Constructed between 1896 and 1906 the Elan Valley Aqueduct carried water from reservoirs in mid Wales to Frankley water storage works to the west of Birmingham. Leakage and a requirement for additional capacity requires the route to be updated with a series of by-passes. Geotechnical Observations is monitoring the existing structure whilst cofferdams are installed to enable tunnelling to be undertaken. We are doing this using horizontal and circular SAAs to measure displacements, triaxial geophones to measure vibration and crack gauges. 73 miles of tunnel stretching from Reading in the west to Shenfield in the east passes beneath the centre of London along Oxford Street. At Bond Street it interfaces with London Underground’s station and a cross passage passes below the Mid-level sewer. 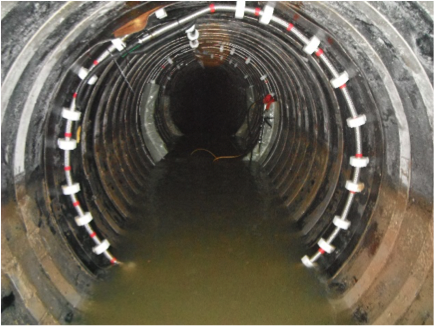 Geotechnical Observations installed 100m of SAA along the crown of the sewer to measure settlement and three circular SAAs (pictured) around the intrados of the sewer to check convergence where the cross passage is located. SAA is ATEX certified making it safe for use in potentially explosive environments. This new dedicated midfield terminal was the UK’s first airside construction project. A 2km diaphragm wall enabled the basement substructure, baggage tunnels and transit railway to be constructed in close proximity to the existing Europier glass-fronted structure , which remained operational throughout. Geotechnical Observations installed over 100 inclinometers in the diaphragm wall and in the ground between the wall and existing structures. We also surveyed the existing structures and installed a “real-time” liquid levelling system on one of them. Situated alongside on of the world’s largest copper mines this huge structure is about 63m high and has a circumference of about 14km at the crest. The dam was built in a region where glacial activity caused significant shearing in the underlying clay deposits. Construction of the dam has re-activated movements along these shear planes, many of which are more than 100m below the toe of the dam. In October 2015 Geotechnical Observations accompanied by Measurand and local contractor Budokop installed a 150m SAA into an existing inclinometer casing where shearing is ongoing. Geotechnical Observations were involved from the beginning of this project, making on site suction measurements to assess the best compaction conditions to manage the highly expansive London Clay. To monitor the ground movements following the compaction GeO installed 50m deep rod extensometers and 30m deep magnet extensometers, with VW piezometers being used to monitor the dissipation of excess pore water pressures and inclinometers being used to monitor the deflection of bored piles used to retain the swelling clay. The geological conditions on the river bed made it difficult to seat the caissons used for casting the foundations, so grout curtains were constructed and lateral deflections were monitored using SAAs during construction of the concrete footings. The 7m long SAAs were installed though 40m long conduits. Vertical displacements of the caissons were measured using vibrating wire crack gauges.